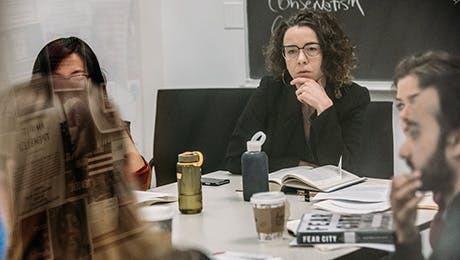 This is the second in a series of Research Matters articles profiling the interdisciplinary climate change work of students, faculty, and alumni at The New School for Social Research. Check back for more! Who is truly responsible for the climate's state of disrepair? Who should be responsible for preventing further deterioration of the environment? To help address these questions, Research Matters sat down with Eric Godoy, a recent doctoral alumnus of the Philosophy Department at The New School for Social Research and current Assistant Professor at Illinois State University. His research focuses on the ethics and politics of determining responsibility for the climate, and aims to articulate a frame for responding to it. “I guess I've always been concerned with climate and climate change,” Godoy said. But his path to a PhD in philosophy was somewhat unexpected, given earlier interests in questions about climate from a scientific perspective. Having entered college as a chemistry major, he conducted research on waterways near his hometown in Central Florida. In the course of his fieldwork, he witnessed firsthand the disruption of delicate balances in the local waters, and began to consider ethical and political questions. After serving as Assistant Chair of the Department of Social Science and Cultural Studies at Pratt Institute, Godoy recently accepted a position at Illinois State University, where as Assistant Professor he is currently contributing to an effort to expand the university's environmental studies major and minor. Over the past few years, Godoy has deepened his investigation into how ethics (and ethicists) can cope with a challenge as complex and overwhelming as those presented by climate change. Godoy sensed that urgent issues related to climate change and environmental degradation are best explored within the framework of social and economic justice, but that little existing scholarship considered the issues from this perspective. “The question of where moral value resides is really interesting to me when it comes to climate change,” Godoy said. “There's a far more pressing question that climate change presents […] and it's going to get much worse.” The relative absence of justice from considerations of climate change seems, to Godoy, especially the case in his discipline. As he explained, “Especially outside of philosophy where a lot of the work focuses on environmental justice, climate change [is treated] as fundamentally a justice issue,” he said. Godoy's work digs deeper: if environmental issues are fundamentally about justice, then who is the injustice being done to, and who can be said to be responsible for taking action? How can individuals ever feel individually responsible for such a large-scale problem? And if the responsibility resides with institutions or entire ways of life, then whom should we urge to action? This is kind of dangerous because there are plenty of corporations that will give those individuals an answer for a low, low price-just buy this, and do that-and these things don't make much of a difference. The challenges are structural, and the solutions are political. So when we atomize responsibility, when all I have to worry about is whether or not I recycle, whether I remember to bring my reusable tumbler to Starbucks, that's dangerous because it diffuses all that energy and motivation that people have. In more recent work, Godoy has written about the case of university campaigns to divest from fossil fuel companies. These efforts complicate the distinction between individual and collective action, as the campaigns are often made up of students, faculty, staff, and even Board members. Asked what attracted him to this kind of activity, Godoy responded, “For one thing it's interesting pedagogically. For another, the communicative force of saying 'this is not something we should be doing, this is not something we should be profiting off of.' So it sends a very public message, and it comes from knowledge producers, which I think carries a certain kind of authority.” In this case, the agent of the activism is a single entity-a specific college or university-but the action illuminates how intimately individual persons and institutions are related at the level of economics and politics to the actions of big business, and especially, to the fossil fuel industry. As a philosopher managing research that moves between disciplines, Godoy said, “I've always admired people, like Nancy, who can navigate two worlds. I've tried to push myself to work on interdisciplinary teams and to build relationships with different kinds of people so I can write with them.” Asked how this had worked out, and what he had learned about the terminological and methodological differences that exist between disciplines, he responded, “I think there's something to be said for using disciplinary boundaries.” He clarified that despite one's best intentions, it's often quite difficult to co-author research across discipline lines without sacrificing some of the precision gained through disciplinary specialization. “I do think that when you try to approach real problems, you do give up a bit of precision,” he said. “But in the end, you might have to bracket certain issues in order to be able to work together.” Given the global magnitude of the challenges presented by climate change, the need to think through issues of individual and collective responsibility-and beyond intellectual specialties-has never been greater.